How many coastal lakes and lagoons are there in NSW? There are about 135 estuaries of various sizes in NSW that drain to the sea including rivers, bays, creeks, lakes, lagoons and inlets. Of these about 90 are coastal lakes and lagoons bigger than one hectare. Many coastal lakes and lagoons alternate between being open or closed to the ocean. These are known as Intermittently Closed and Open Lakes and Lagoons (ICOLLs). About 70 of the coastal lakes and lagoons in NSW are ‘ICOLLs’. ICOLLs are located all along the NSW coast. Most occur south of Sydney where catchments are generally smaller in size and experience lower average rainfall. 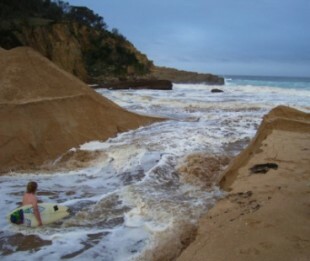 Average wave activity is also generally higher and can push sand into estuary mouths. Why do ICOLLs open and close to the ocean? ICOLLs are separated from the ocean by a sand beach barrier or berm. This entrance barrier forms and breaks down depending on the movement and redistribution of sand and sediments by waves, tides, flood flows and winds. ICOLLs open and close to the ocean naturally in a constant but irregular cycle. When there is sufficient water flowing into the lake or lagoon from the catchment area (usually following heavy rainfall), water levels in the ICOLL will rise. The water levels in ICOLLs can often rise rapidly (within hours or days depending on the catchment size) in response to higher rain events (e.g. 50mm+). Eventually the water in the ICOLL will spill over the entrance sand berm and drain to the ocean. The force of the backed up water then quickly scours an entrance channel through the beach and reopens the ICOLL to the ocean. When ICOLLs are open they become tidal with seawater moving into and out of the estuary with the daily tidal cycle. ICOLLs close when the ocean waves and tides push sand from offshore into the entrance, which gradually closes the entrance channel. Without further large freshwater flows into the estuary from the catchment, the ICOLL will remain closed to the sea. When ICOLLs are closed they do not exchange water with the ocean and water levels within them fluctuate depending on rainfall, catchment inflows and evaporation. During wetter times many ICOLLs remain constantly open to the ocean. In times of drought and reduced rainfall ICOLL entrances close more frequently and stay closed for longer periods of time. It is common for many ICOLLs to remain closed for several years at a time. As well as rainfall, specific local conditions such as catchment size and headlands near the entrance determine if an ICOLL is mostly open or mostly closed. However historical records show that about 70% of the ICOLLs in NSW are closed for the majority of the time. Why are ICOLLs artificially opened to the ocean? Many ICOLLs have been, and continue to be, manually or artificially opened to the ocean by various authorities. 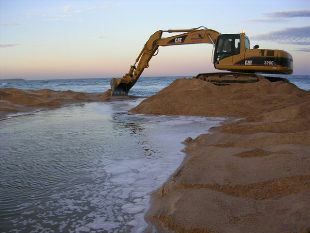 Heavy equipment, such as excavators, are used to artificially open ICOLLs by digging a channel through the sand berm between the ICOLL edge to the ocean. The main reason for artificially opening an ICOLL entrance is to mitigate and reduce the impacts of flooding. When water levels rise in a closed ICOLL following rainfall this can lead to flooding of urban and rural development adjacent to the lake or lagoon foreshore, including private properties, business premises, roads, parklands, sewerage systems and farmland. Artificial breaching of the entrance barrier is undertaken to ‘drain’ the ICOLL to the ocean and lower water levels to relieve existing flooding of foreshore development and infrastructure or avoid the likely threat of flooding which would occur before the ICOLL entrance opens naturally. The trigger for artificially opening many ICOLLs (rather than let nature takes it course) is often a consequence of past developments being allowed to be located in low lying areas too close to the edge of the lake or lagoon. Who is responsible for managing ICOLL entrances and artificially opening them? Responsibility for undertaking artificial openings of ICOLL entrances usually lies with the local Council under their duty of care to the local community. ICOLL entrances located within National Parks and Nature Reserves are managed by the Department of Climate Change and Water (DECCW). Usually the ICOLL entrance is Crown Land so Councils are required to obtain a licence under the Crown Lands Act 1989 from the Lands and Property Management Authority (LPMA) to undertake the entrance opening works. They are also required to obtain a permit from the Marine Park Authority if the ICOLL is located in a Marine Park. In some cases, Councils hold a 5 year ongoing licence which allows them to open specific ICOLL entrances within their jurisdiction as needed provided they are done in accordance with an agreed estuary management plan or entrance management policy. Prior to artificially opening an ICOLL entrance, the local Council or other relevant authority is required to consult with and obtain the agreement of other State Government agencies, including Industry and Investment NSW (I&I NSW), DECCW and the Marine Parks Authority, if the ICOLL is located within a marine park. 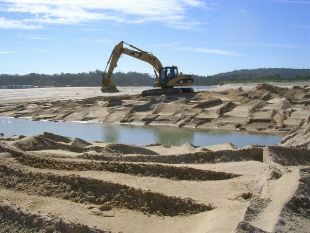 Estuary management plans and entrance management policies are developed and adopted by local Councils, with assistance and funding from DECCW (under the NSW Estuary Management Program), and advice from other State Government agencies (including I&I NSW) and the local community (often through a estuary management committee set up by the Council). These plans/policies contain the rules and procedures for carrying out artificial openings of particular ICOLLs based on local specific conditions, including a set ‘trigger’ water level at the estuary entrance, measured in metres Australian Height Datum (AHD) above mean sea level, which must be reached before the entrance to the ocean will be artificially breached. Not all the ICOLLs in NSW have agreed entrance management plans or policies and artificial openings of ICOLLs can sometimes be conducted by Councils on an ad hoc basis in response to community demands. Management of ICOLL entrances is sometimes a controversial issue in local communities with competing interests wanting entrances opened more often or less often for different reasons. On occasion, local community members have even attempted or succeeded in artificially opening ICOLLs without obtaining approval or using appropriate methods which has led to unwanted consequences, including fish kills. Such activities are also illegal and offenders can face fines or prosecution for their actions. Closed ICOLLs can often cause community concern over issues such as perceived ‘poor ‘ water quality, unpleasant smells and odour, flooding of low lying areas of the foreshore and the health of fish stocks. It is often suggested that ICOLL entrances should be opened to flush out the ‘dirty’ water and replenish it with ‘clean’ seawater. However, just because an ICOLL is closed does not necessarily mean that it has poor water quality. Many closed ICOLLs maintain good water quality and remain suitable for swimming, water sports and fishing for long periods of time. Furthermore, artificially opening an ICOLL entrance will not always improve the water quality due to the limited tidal movement or ‘flushing’ in most ICOLLs. After heavy rainfall the water quality in a closed ICOLL can temporarily worsen as a result of runoff containing sediment, nutrients and pollutants entering the ICOLL from creeks and drains throughout the catchment. In many instances opening the entrance is not the solution and consistent poor water quality is better addressed by improving the management of catchment inputs to ICOLLs. When ICOLLs are closed for long periods some plants growing around the lake edges (such as Casuarinas) may die from prolonged waterlogging. However this is a natural process with riparian vegetation gradually advancing and retreating along the foreshore in response to varying water levels over time. Potential loss of riparian vegetation can be managed in ways other than artificially opening the entrance, including ensuring there are sufficient replacement plants growing on the landward side of the foreshore (i.e. maintaining or establishing riparian buffer areas) and planting or allowing natural rehabilitation of more suitable species that can tolerate wet, salty soils, such as saltmarsh and mangroves. It should be remembered that flooding and drying are natural components of the hydrological and ecological processes operating within ICOLLs. Coastal lakes and the life they support have evolved in response to these forces and to maintain a ‘healthy’ lake ideally it should be left to operate as close to natural as possible. Are open ICOLLs better for fish? ICOLLs are very complex environments and the impact of artificially opening entrances on fish species and fish habitats is not well understood. Many species of estuarine fish and prawns that are targeted by recreational and commercial fishers breed in oceanic or coastal waters and enter estuaries and ICOLLs from the ocean as larvae and juveniles. While some fish need to migrate to the sea to complete their breeding cycle, others reproduce in the estuary and do not require an open entrance for spawning. Long periods (i.e. 3 to 4 years or more) of entrance closure may restrict the recruitment of certain fish species to ICOLLs. However, some fish and fish larvae will enter an ICOLL from the ocean even if it is only open for a short period of time, or during ‘wash over’ events when seawater flows over the entrance berm during high tides and storm surges. Although enhancing the recruitment of fish and prawns is often cited as justification for artificially opening entrance barriers, fish and prawn recruitment processes are not fully understood and are likely to be very dependent upon climatic factors, as well as a number of other environmental variables. Artificially opening an ICOLL entrance for the objective of enhancing fish recruitment would require a detailed sampling and analysis of offshore larval populations in the adjacent ocean area. Without such sampling, fish recruitment is not assured and any success may ultimately depend to a large extent upon luck. Further, artificial opening of an ICOLL to promote production of one species or group of species (e.g. prawns) may in fact disadvantage other species (e.g. finfish), with the final outcome being no net benefit. For example, it is well known that when a ICOLL is first opened after a long period of closure large numbers of mature fish and prawns exit the estuary for the ocean which can reduce fishing opportunities for legal size fish in the ICOLL for some time after. This is particularly the case with smaller coastal lakes and lagoons which contain less fish overall. Furthermore, research has shown that some of the most productive estuaries for commercial fishing are those that are closed to the sea for long periods. Larger ICOLLs are often more productive in fish than permanently open estuaries. Estuarine fish are adapted to the varying conditions experienced in ICOLLs, such as changing water levels and salinity. They can survive for many years in closed ICOLLs without the need for the entrance to be open to maintain fish stocks. What are some of the impacts of artificially opening ICOLLs? Artificial opening of ICOLLs results in a rapid lowering of the water level and the exposure of extensive areas of sediment and aquatic vegetation such as seagrass and algae. Exposure of sediments to the air and the death of aquatic vegetation can lead to the release of hydrogen sulphide (rotten egg gas) and other foul smelling gases which often lead to odour complaints by residents and visitors. Decomposition of exposed aquatic vegetation can also result in deoxygenation of the water column (low dissolved oxygen (DO), which can lead to the death of fish from suffocation (i.e. fish kills). Under natural conditions, closed ICOLLs break out over a relatively wide range of water levels which is termed the ‘natural breakout range’. An occasional artificial opening of the entrance within this range is not likely to have a significant environmental impact since it falls within the expected natural variation. However, over the longer term, numerous artificial openings especially at a low water level is likely to have a significant environmental impact since the natural frequency and duration of opening and closing to the ocean will be significantly altered. In the short term, more frequent openings can lead to increased exposure and death of aquatic vegetation and increased risk of low dissolved oxygen and incidence of fish kills. Over the long term, more frequent openings will lead to shifts in the structure and distribution of fringing riparian vegetation communities. Should rock walls be built or entrances dredged to keep ICOLLs permanently open to the ocean? It is sometimes suggested that the best way to ‘fix’ perceived ICOLL problems is to undertake works such as building rock training walls, groynes or regular dredging to permanently open the estuary to the sea. However, lake entrance works are very costly (millions of dollars) and can have many undesirable effects including permanently changing the ecology of the lake (including fish stocks and fish habitats), changing flood behaviour in the catchment, creating tidal currents and influences on sediment movement, and altering tidal flushing that may lead to poorer water quality and higher salinity in backwater areas. Often the perceived problems with ICOLLs (e.g. flooding and poor water quality) can be better managed by increased public awareness of ICOLL environments, and dealing with issues in the catchment (e.g. reducing polluting inputs, relocating or raising assets and infrastructure) than undertaking costly entrance works. It is important to recognise that ICOLLs have always been dynamic coastal environments. They are significantly different from bays, harbours or inlets which are permanently open to the sea. 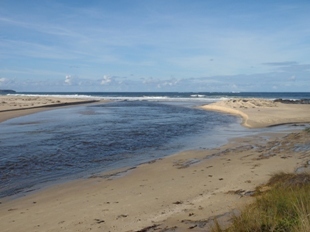 NSW already has many permanently open estuaries which can be enjoyed by those people who prefer this type of waterway. What are I&I NSW’s policies on ICOLL management? Any proposals for artificial opening of ICOLLs must seek the approval or concurrence of I&I NSW under the Fisheries Management Act 1994. The Department supports minimal interference with ICOLL entrance barriers and advocates natural processes being allowed to operate to the greatest extent possible. The Department does not support the artificial opening of an ICOLL unless the proponent (i.e. Council or other agency) can demonstrate that the social, environmental and economic benefits greatly outweigh any potential adverse impacts. The Department supports using estuary management plans and environmental assessment processes to analyse the issues relating to opening a particular ICOLL, and to develop an entrance management plan or entrance management policy. Proposals for artificial openings which are to be carried out according to a formulated entrance management plan or policy are more likely to be approved by I&I NSW. a) The decision to artificially open an ICOLL should be made on the basis of factual data on verified water levels (referenced to AHD), the nature and extent of associated flooding impacts, and evidence of changes to relevant water quality parameters (especially nutrient and bacterial levels) obtained by relevant water quality monitoring programs. other environmental parameters (e.g. avoiding the breeding season of threatened birds such as the Little Tern). c) In the event that the criteria for an artificial opening are met, breaching should be conducted during a falling tide (if possible, around a spring tide) so that the potential for establishing an entrance channel long enough to flush the water body is achieved. d) Illegal openings should be guarded against by the erection and maintenance of signs near the ICOLL entrance warning people that unauthorised opening is illegal and may result in prosecution. implement community awareness campaigns to gain broad based understanding and support for the environmentally responsible management of ICOLLs.